SAN FRANCISCO, August 14, 2017 – Prosper, a leading marketplace lending platform for consumer loans, today reported significant growth during the second quarter of 2017. 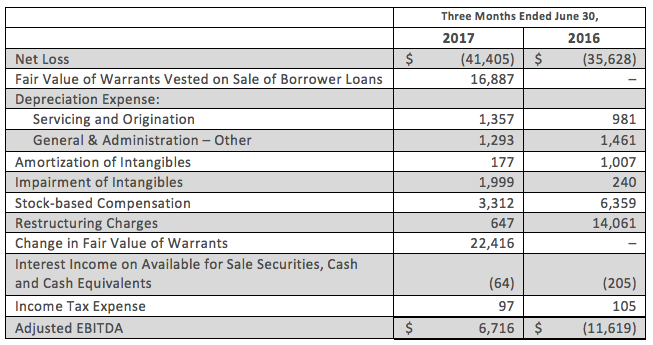 Driven by strong demand for its personal loan product, Prosper facilitated $775 million in loan originations through its platform, up 32% quarter-over-quarter and 74% year-over-year. The company also grew transaction fee revenue 32% quarter-over-quarter and 84% year-over-year. Additionally, the company recently closed the second securitization from the Prosper Marketplace Issuance Trust, Series 2017-2, “PMIT 2017-2.” Approximately $500 million of notes were issued for PMIT 2017-2 which priced at tighter levels versus the PMIT 2017-1 transaction that closed in May 2017. Almost 45 unique investors have now participated in the two securitizations issued under the PMIT program. Credit Suisse Securities (USA) LLC and Jefferies LLC served as joint book runners on the transaction, which was rated by Fitch Ratings, Inc. and Kroll Bond Rating Agency, Inc.
Prosper generated $8.6 million of Net Cash from Operating Activities and Adjusted EBITDA(1) of $6.7 million in the second quarter of 2017, driven by an increase in origination volume, improved marketing efficiencies and lower general and administrative expenses. (1) Adjusted EBITDA is a non-GAAP Financial measure. The accompanying schedule to this press release provides a reconciliation of this non-GAAP financial measure to the most directly comparable financial measure calculated and presented in accordance with GAAP. Our non-GAAP financial measures should not be considered as an alternative to, or more meaningful than, our financial results prepared in accordance with GAAP.